Enjoy a 48-hour Florence hop-on, hop-off tour and enjoy skip-the-line entry to the famous Da Vinci’s Museum. Enjoy skip-the-line admission to Da Vinci’s Museum and browse through a treasured collection of Leonardo da Vinci's inventions. Study the working, life-sized machines designed by the great genius and explore the four fundamental sections: earth, water, air and fire. A day spent at Da Vinci’s Museum promises to be an educational and memorable one for visitors of all ages! Last entrance is 40 minutes before closing time. 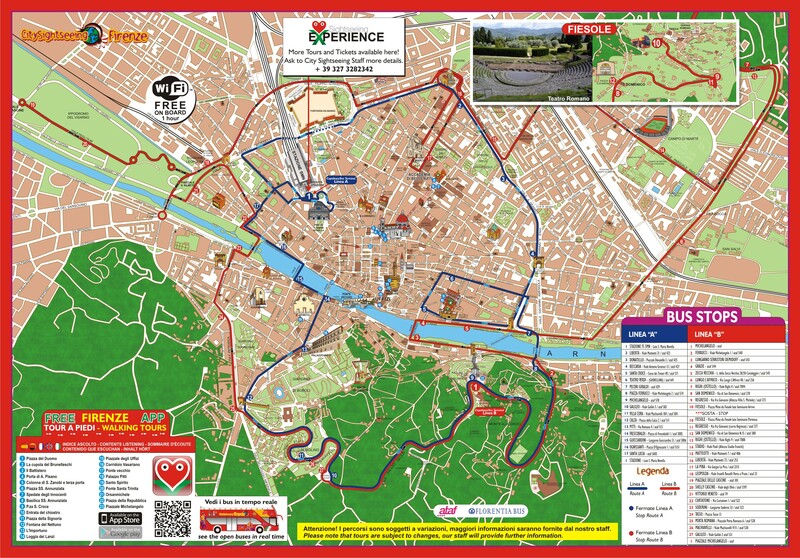 Florence hop-on, hop-off tour: Voucher must be exchanged at STOP N.1 line A OF City Sightseeing Firenze or directly on the bus once you board. You can hop on the bus at any of the stops. Da Vinci’s Museum: Before going to the museum the voucher must be redeemed at stop n.1 of Line A, the museum is located in 66/68R, Via dei Servi, 50122 Firenze FI, Italy in 66/68R, Via dei Servi, 50122 Firenze FI, Italy. Florence hop-on, hop-off tour: You can hop off the bus at any of the stops. Reach Da Vinci’s Museum at your convenient time. Explore an invaluable collection of Leonardo da Vinci's inventions. Upon entering, you can admire the working, life-sized machines designed by the great Genius, and most of them can be tested. An enlightening experience for both adults and children, spend time exploring the four fundamental sections: earth, water, air and fire. The machines have been made by studying the drawings contained in the famous Leonardo da Vinci codes while possibly maintaining the original aspect proportions. Study and compare some of the major anatomical studies of Leonardo and a reproduction of his principal paintings with the use of the backlight technology with very high resolution. The Museum, which contains explanations in Italian, English, French, German, Spanish and Russian are completed by educational projections concerning the life and work of Leonardo. Due to public works, buses of Line A may have some delays. The confirmation voucher includes the local activity operator’s contact details and local telephone numbers at the destination. They will happily answer any logistical questions you may have.Please click here to see the distance between the old Stop 1 of Line A and the new Stop 1 of Line A.